Last week, several iPhone and multi-touch patents are published through USPTO. W. Westerman (Apple), "Gesture Learning," US2008/0163130 A1, Jul. 3, 2008. Although multi-touch increases input freedom, users have to remember many gestures to fully use their multi-touch devices. This patent application presents methods to make people naturally familiar with multi-touch gestures. One example is shown below, where a user learns multi-touch gestures by games such as Tetris, Final Fantasy, etc. W. Westerman and S. Hotelling (Apple), "Peripheral pixel noise reduction," US 2008/0158147 A1, Jul. 3, 2008. W. Westerman and S. Hotelling (Apple), "Far-field input identification," US 2008/0158168 A1, Jul. 3, 2008. W. Westerman, "Multi-touch input discrimination," US 2008/0158145 A1, Jul. 3, 2008. W. Westerman, "Irregular input identification," US 2008/0158146 A1, Jul. 3, 2008. W. Westerman, "Multi-touch input discrimination," US 2008/0158185 A1, Jul. 3, 2008. These patent applications details methods to identify objects on or above a touch screen. Such information is very useful to prevent accidental activation due to inadvertent contact. M. A. Hamblin and S. Hotelling, "Double-sided touch sensitive panel and flex circuit bonding," US 2008/0158181 A1, Jul. 3, 2008. S. Hotelling and B. R. Land, "Double-sided touch sensitive panel with shield and drive combined layer," US 2008/0158183 A1, Jul. 3, 2008. M. A. Hamblin and R. H. M. Dinh, "Multi-touch surface stackup arrangement," US 2008/0158173 A1, Jul. 3, 2008. In these patents, you can find how Apple engineers mechanically configure the touch panel and other sensors into iPhone. B. R. Land et al., "Full scale calibration measurement for multi-touch surfaces," US 2008/0158176 A1, Jul. 3, 2008. C. H. Krah et al., "Multi-touch auto scanning," US 2008/0162996 A1, Jul. 3, 2008. B. R. Land et al., "Error compensation for multi-touch surfaces," US 2008/0158184 A1, Jul. 3, 2008. 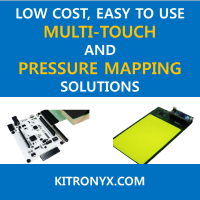 Like other sensors, capacitive touch sensors also suffer from various noises. To enhance the performance of the sensor system, it is crucial to calibrate sensors correctly. US 2008/0158176 and US 2008/0162996 present methods to calibrate sensors automatically. J. G. Elias (Apple), "Projection scan multi-touch sensor array," US2008/0158198 A1, Jul. 3, 2008. In the patent application US2008/0158198, the author tries to build a single-layered multi-touch screen while iPhone utilizes a two-layered touch panel. Its sensing mechnism is unique. Let me quote the author's summary. The proposed device is a single-layered capacitive touch screen and cannot capture two dimensional touch images. That is, it also suffers from ghost-touch phenomenon like other conventional touch screens. Although the patent application details disambiguation process, I don't think that it is a true multi-touch screen. S. Hotelling and C. H. Krah, "Proximity and multi-touch sensor detection and demodulation," US 2008/0158172 A1, Jul. 3, 2008. Future touch panels can detect multiple touches and near touches (within the near-field detection capabilities of their touch sensors) occurring at about the same time, and identify and track their locations. One or more proximity sensors can be used in conjunction with a multi-touch panel. In some embodiments, an exemplary multi-touch panel can include a proximity sensor located at every touch sensor or pixel. In other embodiments, a proximity sensor can be selectively deployed at certain pixels where the detection of touch or hover may be more critical, or in a spread pattern in broad hover-sensitive areas. In still other embodiments, some rows in the multi-touch panel could be proximity sensor rows, with others being touch sensor rows.